Be the first to share your favorite memory, photo or story of Tasha. This memorial page is dedicated for family, friends and future generations to celebrate the life of their loved one. CHURCHVILLE – Tasha Lynn Griffin, 33, of Churchville, died Saturday (November 24, 2018) in her home. Born October 16, 1985 in Waynesboro, she was the daughter of Harold Lee and Bonnie (Davis) Griffin. 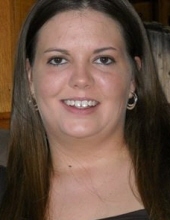 Tasha was a 2003 graduate of Buffalo Gap High School and enjoyed cheerleading there. She was devoted to her three boys and was very invested in their activities. She also had a passion for the elderly and the handicapped, and was gifted in caring for persons with special needs. She attended Jerusalem Chapel United Brethren in Christ Church. She was preceded in death by her maternal grandfather, Douglas R. Davis; paternal grandparents, Herbert G. and Julie V. Griffin; and a special “grandfather,” Elden Griffin. Surviving in addition to her parents of Churchville are three children, Blake Lee Griffin, Caden Nathaniel Griffin, and Cole Scott Griffin, all of Churchville; a brother, Jonathan Scott Griffin and wife Mindy of Millboro; one nephew, Jackson Craun of Millboro; maternal grandmother, Mary Glenn Davis of Middlebrook; a special “grandmother,” Emily Griffin of Churchville; and numerous aunts, uncles and cousins. A funeral service will be held 11 a.m. Thursday, November 29 in Jerusalem Chapel United Brethren in Christ Church, officiated by Pastor Dennis Sites. Burial will follow in the church cemetery. Active pallbearers will be Ken and Doug Wolfe, Adam, Michael and Heath Huntley, Michael Cook, Ben Griffin and Woody Griffin. Honorary pallbearers will be Beth Shaver, Brittany Griffin, and members of the Be All You Can Be Sunday School class. The family will receive friends from 6 to 8 p.m. Wednesday in Jerusalem Chapel. In lieu of flowers, memorial donations may be made toward funeral expenses and for Tasha’s children and mailed to Griffin Memorial, P.O. Box 57, Churchville, VA 24421. Bear Funeral Home is serving the family. Condolences may be expressed to the family online at www.bearfuneralhome.com. "Email Address" would like to share the life celebration of Tasha Lynn Griffin. Click on the "link" to go to share a favorite memory or leave a condolence message for the family.